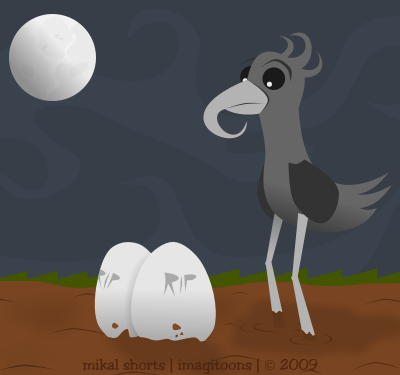 Here we have one of our creepiest creatures, the ghost bird! This nocturnal creature gets its name from its ghastly gray feathers...and the fact that it's eggs always have markings that resemble "R.I.P." on tombstones!! They also get their name from the ghostly howls that they make - no happy little chirps come from these birds! These birds tend to stay in groups which can become very menacing very quickly! Here you can see that ghost birds like mud - lots and lots of mud so we've done our best here at the Imagitoons Zoo to provide for them!! Well, it looks like we're coming to the end of our visit, but we've saved one of my favorites for last! !